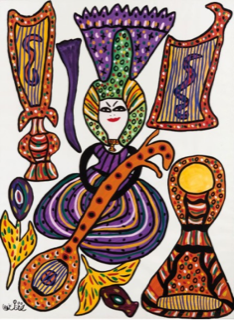 Elmarsa Gallery in Dubai is pleased to present the exhibition of the work of self-taught Algerian artist Baya Mahieddine known as Baya. On view from March 18 through May 2, 2019 at Alserkal Avenue, the exhibition Baya Mahieddine (1931C1998) comprises some 15 gouache paintings that shed light on Baya’s groundbreaking career as the most famous Algerian woman artist. This second show of the artist organized by the gallery draws attention to Baya’s profound influence on North African post-colonial art movements during the mid-twentieth century and beyond. With artists like M’Hamed Issiakhem (1928-1985), Abdelkader Guermaz (1919-1996), Mohammed Khadda (1930-1991), Baya is among the most important and influential artists in Algerian modern art, and, like Frida Kahlo, was often associated with the Surrealist movement. Baya took her inspiration primarily from her homeland where she died in 1998. Her dreamlike quality work, rich in symbols and ornamentation was clearly influenced by her Algerian cultural heritage.